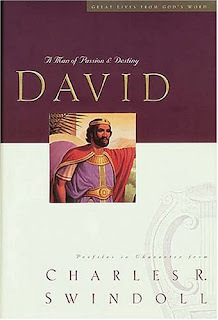 I'm reading a great book right now called "David - A Man of Passion and Destiny" .... I was named after King David so I figured I should read more about him and this book by Charles Swindoll is awesome! One of the things that I read today was that David tried to live his life with "nothing to prove and nothing to lose." I think that's a good message for us as well. It's so easy to get wrapped up in this desire to prove ourself. I think it's really a death trap because if that desire consumes us we will never be able to focus on doing the things we were meant to do. In skimming ahead in the book I also came across David's three major failures and it was eye opening because these are all areas of my life that I struggle with. "He become so involved with public pursuits that he lost control of his family." Of course I don't have a family (yet) but I have at times felt like I've lost my life because of my pursuits and I know how geared I am to pursue these ventures and so this was a good reminder to keep my priorities straight. "He indulged himself in extravagent extremes of passion. Whatever he did he did it with all of his heart" This is me to a T. Since I was very little I was an "All-In" sorta kid. Whether it was soccer, magic, paintball, girlfriends, ninjitsu I was 100% into something. My life has never had "balance" and I actually don't seek balance the way most people would define it...but I do understand the importance of having dimensions to ones life that blend together simultaneously. "He became a victim of self sufficiency and pride" Yup - me again. Probably the most baffling thing in my life is how cyclical it is and although I feel like I'm making progress I still find myself making the same mistakes I did years ago. I remember talking with my friend Dane Sanders years ago about how great it would be to get to the place where we didn't have to think about the decisions we were making because our gut decisions would be the right ones. Maybe someday I'll get there but until then I need help and reminders of who I am, where I've been, and what I'm about and so I'm always thankful for books, my family and friends and most of all God for continually reminding me of that. Ok... wow...that's a long one. one thing i've learned over the years is that "balance" in life, as traditionally defined, isn't what is called of us. hey dj... thanks for being willing to pass on the stuff God is showing you. another cool book to read about king david is "a tale of three kings". very cool. Have never commented on your blog before, but I just want to tell you how inspiring you are! It is such a comfort to know that you struggle with these thing--and aren't afraid to say it! I love how you are not afraid to share what you believe. Not only are you an amzing photographer--but a truly amazing person! Keep up your awesome work! Keep in mind, it was his lack of control of 'passion' that lead King David into difficulties. Passion is a good thing but needs to be kept in check. My guess is that you will never outgrow the need for caution in this area. The most important lesson from the life of King David: though he had several serious 'failures' in life including murder, adultery, etc. David is describe as A MAN AFTER GOD'S OWN HEART. That is huge! Though he failed, yet God demonstrated His love for David in many ways. Also, God kept his commitment to keep his lineage on the throne of Israel as can be confirmed through the gospel records in Matthew and Luke. So, the question is not "Will we fail" but "what will we do when it happens"? David picked himself up, confessed his wrongdoing to God, made a mid-course correction and went on to accomplish even more for God. That is my kinda king. I'm going to try to make it to your Ohio Gig to meet you. You have been an inspiration for me as I have developed my wedding photography. Look forward to meeting you. Thanks man for just being you. Not to pump your pride, but you are an encouragement and glimmer of hope for me and countless others. Keep your eyes and heart where they need to be and stay clean and close. Love you man. That book is on my shelf DJ- I have the companion workbook that goes along with it, which we studied in a men's bible study group together- really awesome book! You'll love it my brother! Totally amped to visit Charles Stanley's church when we move to Atlanta next month- who doesn't like that guy huh?